With our Masonry Course we teach individuals who want to enter the masonry trade with little to no experience, or those who have some existing construction experience, the skills needed to make top dollar wages and expand their business. What could this increased pay mean to you? Your spouse could now stay home with the kids. You could finally buy that dream house you always wanted. Your children’s future will be more secure. The possibilities are endless. We have helped many mason laborers learn the “secrets” to laying brick that the veteran brick layers don’t want them to know with our Master Masonry Course. Some individuals choose our masonry course for DIY skills necessary to complete home brick projects. Some use their new skills to build the foundations of their off grid homes and cabins in the woods. Give yourself the ability to put thousands of dollars you would spend on these projects back into your own pocket. Other’s use the course to start their career as bricklayers and masons, pulling in higher salaries than they were ever able to muster with their college liberal arts degrees. The satisfaction you will get from learning this new trade and doing bricklaying projects yourself is hard to put a price on! How Much Can I Expect To Make Once I Get Trained And Get A Job As A Mason? According to the 2016 Bureau of Labor Statistics, the average hourly rates for a brick mason was over $26 an hour with many many making quite a bit more than that – Especially those taught high quality, old school workmanship techniques by Charlie Cummins! What Kind Of Support Can I Expect During The Training Process? Our masonry course comes with free support, of course. If at any time you need help with your courses or have questions regarding any technique, or just general questions, you can contact us or call us in the USA: 602-692-1896 and we will usually have your answer to you within an hour during normal business hours. You will receive an answer within 24 hours if we are contacted outside normal business hours. If the question is too difficult for our support staff, you will get direct access to one of our highly trained Master Masons or even Charlie Cummins himself. What Is Included In The Online Masonry Course? Locked-In Lifetime membership and free upgrades. Unlimited support for any questions you may have while taking the course. Bricklayer pdf book that goes along with the masonry course. Job placement assistance for everyone who completes the Masonry Course and becomes Brick Certified. We currently have a 98% job placement success rate for our Brick Certified masons. What Can I Expect To Pay For Materials To Do The Training? In addition to purchasing our knowledge and know how, you will also be required to obtain easy to obtain materials to study with and build your bricklaying “lab” at home. These are obtainable at any home improvement center. There is a list of materials needed for the course in the lesson plans. The cost of these supplies will vary, depending on where you are located and how you obtain them. The average cost is between $100-$300 retail. When you are finished with the course you will have plenty of supplies left over for your own projects. What About The Mortar? Won’t It Get Hard?!? The mortar used in this course is a special mixture used for masonry students. Unlike regular mortar, if kept sealed in a bucket it will not get hard and will remain moist. When exposed to air and allowed to dry it will become semi-hard, but all that is needed to use it again is to easily crush it and re-wet it again, over and over as needed. You will re-use the same mortar over and over! How Much Space Is Required To Complete The Training? You don’t need that much space! You will need approximately 5 ft. by 5 ft. for your set-up (minimum). Students have taken the course in their basement, garage, carport, back yard, and even in a spare room in their house or apartment. What’s The Difference Between Your Instruction Versus That Of Others? Since you are probably new to masonry, at this stage you not be able to distinguish between high quality and mediocre bricklaying. Rest assured, once you have become adept at the old school bricklaying techniques taught in master mason Charlie Cummin’s course, you will forever be looking at brickwork wherever you go and will be thankful you learned how to lay brick and block fast, efficiently, with less fatigue, and most importantly, with high quality from Charlie Cummins. Take a visit to YouTube and compare videos of Charlie’s students against those at vocational schools or even against supposed seasoned brick masons and you will start to see the differences for yourself! 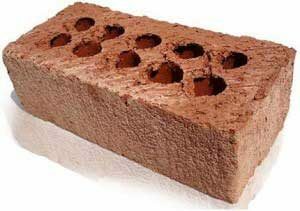 When I Have Completed The Class, How Do I Become Brick Certified? Lay (128) modular bricks in one hour or less. Lay (42) 6x8x16 concrete masonry units, CMU, in one hour or less. Build a brick chimney or brick pier that is 2 foot x 2 foot square. Lay 100 modular brick using a 4 foot builders lever in 2 hours or less, as well as all brick corners. If you are located in a state with one of our “in person schools”, you can get tested at the site by one of our Certified instructors. The majority of our online students are not located in one of these areas so we permit them to send in photo and/or video proof of the completed projects (we have many who have done this, you can see some of their videos on this site) along with a witness signature showing the time the projects were completed in, as well as proof of identity of the person taking the certification. How Do I Learn To Lay Brick, Block, And Stone? Go to the bricklayers union (if you can find one) and ask them if you meet their qualifications. Don’t be discouraged if you can’t find a union or do not meet their qualifications. Unions lay less than 4% of all the brick, block, and stone that is laid in the US. Find a Contractor who will train you on the job. Honestly, you will have better luck with the Bricklayers Union. If you do find a contractor he will start you out as a helper. Contractors always need helpers as the turnover rate is very high. If you go to work as a helper, you should make sure your contractor/boss really gives you on the job mason training within 3-6 months. The unfortunate fact is that helpers are usually in high demand and contractors are also usually reluctant to train someone who might quit and become their competitor once they’ve been trained. Go to www.bricklayingschool.com (well, you are actually here already!) and take our hands-on home study course, or attend one of our schools in person. Start calling them and you will soon discover that many of them have either never actually taught masonry, or if they have they haven’t taught it in many years. Why Is Bricklaying & Masonry In Such Demand? For several reasons. First, there has been a shortage of bricklayers and masons trained over the last 50 years. 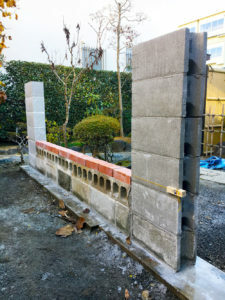 Next, due to the large numbers of natural calamities like earthquakes, tornados, high winds, and other natural disasters the construction industry has finally figured out that a brick, block, and concrete buildings are stronger than 2×4’s, plywood, and chicken wire with plaster smeared all over it. Masonry is now making a strong comeback and there is a shortage of quality bricklayers and masons. We teach QUALITY. Where Are The Jobs, Building Projects, And New Construction? It really doesn’t matter where you live in the US, you can’t drive 30 miles from your house and not find a new building, house, fire department, court house, military base, water treatment, sewage treatment, school, prison, government building, Lowe’s, Walmart or Home Depot or some other building being constructed. In short, the opportunities are everywhere. Why Should I Take The Masonry Course And Become Brick Certified? We will not only teach you to lay brick, block, and stone, but we will teach you to be VERY good at it. With founder Charlie Cummins extensive knowledge and world class training techniques, you will have an advantage over nearly all of those entering the mason industry and even over those with many years of experience. Should I Take The Course For DIY, Or For Brick Certification? This course is ideally suited for the DO IT YOURSELF’ER and you do not have to follow through with certification. This course teaches the basics of masonry and equips you with the skills to take on any home improvement mason project you choose. 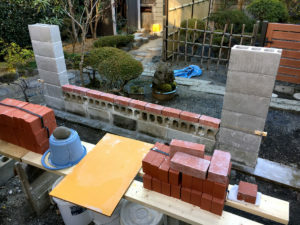 Frankly, even if you build your own brick planter, BBQ or other masonry project you will probably spend less for the course than you would if you had a professional brick mason do the work for you. 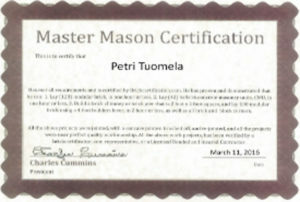 However, this masonry course is geared for the person who wants to make their living as a mason, or contractor. You can make top dollar mason wages working with great companies or even create your own company be your own boss. How Do I Know Contractors Will Hire Me After I Receive Brick Certification? Your certification is proof you are able to complete the skills written on the certification. These are the skills contractors want. Our school guarantees that anyone who gets Brick Certified through our masonry course will be able to get a job and we offer job placement assistance anywhere in the country. We currently have a 98% successful placement rate for all Certified Graduates. I Have A Police Record, I Just Got Out Of Prison, I Am A Ex-Fellon. Will I Be Hired? Brick masonry is a very good way to get a new lease on life provided you are serious about doing a good job because very few contractors will ever ask for a resume. Most will want you to go to the project with your tools and if you can do what is written on your Brick Certification, you will be hired. Most do not care about what you did yesterday, they care about you showing up for work on time and doing quality work from this day forward. I Only Have A GED, Can I Still Qualify To Be A Bricklayer Mason? To be a bricklayer/ mason, you mainly need to have the desire and ability. Kind of like Henry Ford with his 6th grade education, Thomas Edison with his 3 months of public schooling, or Abe Lincoln who was self-taught. The masonry trade is unlike the computer, auto mechanics or other trades and professions where by the time you figure it out, they have changed everything and you have to go back to school again. Laying brick has and always will be done the same way as it has been for the last 5000 years. How Long Will It Take Me To Finish The Online Courses In The Comfort Of My Own Home? This mostly depends on you and your personal situation. After training a few thousand masons, both in person and through the hands on home study course, we have found that it takes an average of 250 to 300 hours of hands on training and practice. That certainly beats a 3-4 year apprenticeship. We are talking about men and women who have never had a trowel in their hand. We have had a dozen or so mason helpers who have finished the course in 200 hours of hands on training. How Soon Will I Be Able To Start Making Money? Charlie said, “Well, the course wasn’t meant to teach 75 year olds how to be contractors in their first 30 days, but nevertheless this is a GOOD problem to have!” Charlie guided him on how to figure out the square footage, the number of bricks per square foot, and then told him to charge $10-15.00 a brick. I Want To Work For Myself, Can You Help Me? I Would Like To Come For Personal Training. How Much Will This Cost And How Long Will It Take? In person schools are coming soon and will cost in the range of $5-10,000 and take at least 1 to 3 months of intense hands-on training. We also offer one-on-one classes with our founder and Master Mason Charlie Cummins. These classes are specifically designed for your specific needs. Please call us for details. Why Would I Want To Be A Speciality Masonry Contractor? Ask yourself; How much money am I ready to work for? Believe it and you will achieve it. Are You Ready Yet To Become A Member Of One Of The World’s Oldest, Well Paid, And Most Prestigious Crafts? Isn’t It Time To Become A Real Brickmason?